Performer Brian Nankervis says he is “bitterly disappointed” over Seven’s decision not to renew 2012 chat show Pictures of You. The Working Dog-produced show saw celebrities sharing photos and memories of their past. After Anh Do told his remarkable story about his childhood as a refugee, Seven scored huge ratings for his Anh Does Vietnam specials. “It was seemingly received very well, the critics loved it, people loved it, the figures were pretty good. It got moved around a bit, which was a little frustrating,” he told TV Tonight. Nankervis, currently appearing in the 11th season of RocKwiz on SBS, is also doing warm-up on Seven’s upcoming SlideShow. “It’s an odd feeling doing the warm-up for a big budget Channel Seven show and there I am thinking, ‘Well. Ok. I could have been doing another show,'” he says. “But it was an incredible opportunity and I was very grateful to be in my mid-50s hosting a show. 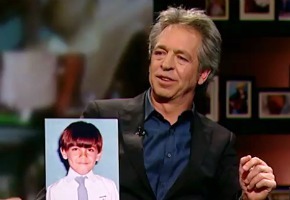 Pictures of You also had a recent live run, but Nankervis isn’t sure if it may lead to a revival on another network. I really enjoyed this show too, lets hope another network snaps it up. Just wasn’t a commercial TV idea. Much better suited to public broadcasters. This show looked cheap to make but I suspect Working Dog’s price tag was a little higher than you all think. Plus it didn’t rate. Seems like a pretty simple decision to me. Hamish….snap it up before Nine gets its paws on it. one of the very few shows 7 had that had both a good critical reception and good ratings, they have plenty that were either one. doesn’t make sense to axe it. working dog make great shows, and utilise great talent well, but they are notorious for being difficult to work with and clashing with network execs, i’d say there is more to this story. and i agree brian is very underrated, there should be more hosts like him that know their place as an interviewer ie. not being all about him. Nankervis is an underrated gem of a talent and I’m stunned we don’t see more of him. This was a great show for what it was. Definately deserves another run. Could probably be made a little cheaper if that’s the main concern. If you have the right guests and photos, it can be both hilarious and moving and reveals another layer to the guests. Bring it back somewhere…maybe the ABC or SBS would like it. This was a very enjoyable show which would be cost effective to produce. Ten and Working Dog had an excellent relationship before Seven swooped in and didn’t have much success. Time for Ten to start working with Working Dog again. Bring this back…The Panel…and develop some new stuff. Come on Ten – Go for it!!!! Use of all that money you did not have to spend on Cricket broadcasting rights! I was in the audience for the taping of the pilot. I found it pretty boring because they let each segment run 15-20 minutes in real time and had an awkward mix of hilarious comedians with really boring ex-politicians and sportsmen (no-one cares what the name of the favourite auntie of a random politician was). Because of this I never watched it when it actually aired but Im guessing by the comments and ratings that it was tightened up a lot and they had a much better mix of guests. Apart from non-studio reality shows like Motorway Patrol which only need a few camera crews and a voice-over, this would surely be one of the cheapest 7 shows to produce. Brian would surely do this for free, just to host a prime-time national show, surely the guests aren’t paid as they want the publicity and there are no prizes or exotic filming required. They provide their own photos, I don’t think there is much research done by the producers, so the only real costs are the studio production and basic editing. Surely 7 were getting a great return on this show over expensive purchased US dramas like Bones?!? Uncharacteristically stupid decision by Seven as POY was one of the best shows on TV last year. Very, very entertaining and informative and Nankervis was a fantastic host. He never butted in or tried to take any attention off the celebrities. I sincerely hope one of the other stations picks this show up. Very disappointing news. Hope another network snaps it up as it’s a great format (and would be pretty inexpensive to make). Wasn’t this doing around 700-800k when it settled into the 9:30pm slot after PTTR. Surely it doesn’t cost that much to make and it was really enjoyable to watch. I agree with Brian, I’m also bitterly disappointed. This would be a perfect time for Ten to swoop back on Working Dog and bring their shows back to Ten. TGYH and All Aussie Adventures repeats would go well on One. New Pictures of You and new TGYH on Ten. Sure it’s not Big Brother or Hamish & Andy but it’s something to fill the hole with no GNW or TAYG and maybe no COW either. Production costs would have been low ?